[S910] 1921 Canada Census, MacDougall ID# 0237. [S420] Obituaries from The Oran Newspaper, Obituary of Archie A. MacDougall, March 24, 2004. [S9] Births, Church Record, June 1977 to September 1944 St. Joseph's Church, Margaree, Records, page 48, line 32. [S861] Ancestry.com, online www.ancestry.com, 0861 - 0243 - Mary Ann MacDougall.docx. [S861] Ancestry.com, online www.ancestry.com, 0861 - 0238 - Ronald Francis MacDougall.docx. [S9] Births, Church Record, June 1977 to September 1944 St. Joseph's Church, Margaree, Records, page 48, line 9. [S9] Births, Church Record, June 1977 to September 1944 St. Joseph's Church, Margaree, Records, page 62, line 31. Married Name: As of circa 1900,her married name was MacDonnell. [S320] 1881 Canada Federal Census, 101 Newbury Street, Boston, Suffolk, Massachusetts, USA. [S899] 1871 Canada Federal Census, 101 Newbury Street, Boston, Suffolk, Massachusetts, USA. Married Name: Her married name was Haverstock. [S497] St. Michael's Parish Record, East Margaree, online www3.nf.sympatico.ca/trish.leblanc/stmichaels.html, Birth record of Mary McDonald. [S497] St. Michael's Parish Record, East Margaree, online www3.nf.sympatico.ca/trish.leblanc/stmichaels.html, Birth record of Jenneth McDonald. [S497] St. Michael's Parish Record, East Margaree, online www3.nf.sympatico.ca/trish.leblanc/stmichaels.html, Birth record of Donald McDonald. Name Variation: Patrick MacDonald was also known as Peter. Biography*: Catherine came to this country with her parents in 1826. She was known all around the countryside for whole soul hospitality and Christian virtues. She was living at Lake Ainslie at the time of her marriage. [S500] Allan J. Gillis, "Descendants of Angus "The Miller" MacFarlane # 74," e-mail to Donald James MacFarlane, October 11, 2005, page 1. [S100] Obituaries from The Casket Newspaper, 1852 - present, Obituary of Mrs Angus MacFarlane, 54-1906-42-5. [S148] Drummer on Foot, September 11, 1913. [S329] April 11, 1881 Canada Federal Census, 101 Newbury Street, Boston, Suffolk, Massachusetts, USA. [S100] Obituaries from The Casket Newspaper, 1852 - present, Obituary of Angus MacFarlane, 53-1905-20-5. [S341] Registration form to Gathering 2001 Committee, August 3, 2001, sheets 49, 54, 69. [S497] St. Michael's Parish Record, East Margaree, online www3.nf.sympatico.ca/trish.leblanc/stmichaels.html, page 15. [S506] Robert Joseph Gillis, Two Gillis Families, page 90. [S701] Certificate, see memo marriage of 1862-1908, McFarlane-Coady 1873. [S701] Certificate, see memo marriage of 1862-1908, McFarlane-Gillis 1877. [S952] 1871 Canada Census, MacFarlane # 0074. [S616] Marriages Registered in Nova Scotia, Inverness County 1864-1877: #9, envelope # 48. [S673] Allan J. Gillis, "Descendants of Unknown MacLean." [S497] St. Michael's Parish Record, East Margaree, online www3.nf.sympatico.ca/trish.leblanc/stmichaels.html, Birth record of Jean Pierre McFarlane. [S701] Certificate, see memo marriage of 1862-1908, McDonnell-McFarlane-1881. Language*: James A. MacFarlane spoke English. Biography*: He taught school for more than twenty years, was a great naturalist, especially in botany and ornithology. There was not a flower or bird in the country but he knew. [S701] Certificate, see memo marriage of 1862-1908, McDougall-McFarlane 1907. [S100] Obituaries from The Casket Newspaper, 1852 - present, Obituary of MacFarlane, John P., 77-1929-35-2. New England Historical Genealogical Society; New Hampshire Bureau of Vital Records, Concord, New Hampshire; New Hampshire, Marriage and Divorce Records, 1659-1947. [S269] April 20, 1901 Canada Federal Census, 101 Newbury Street, Boston, Suffolk, Massachusetts, USA. Biography*: John P. carried on an extensive mercantile business at Margaree Harbor for many years but turned to farming in his later years. [S319] 1881 Canada Federal Census, 101 Newbury Street, Boston, Suffolk, Massachusetts, USA. [S335] April 1901 Canada Federal Census, 101 Newbury Street, Boston, Suffolk, Massachusetts, USA. Year: 1911; Census Place: 22, Inverness, Nova Scotia; Page: 3; Family No: 24. [S497] St. Michael's Parish Record, East Margaree, online www3.nf.sympatico.ca/trish.leblanc/stmichaels.html, page 11. [S100] Obituaries from The Casket Newspaper, 1852 - present, Obituary of Mrs. MacFarlane, Mrs. John P. (Mary), 78-1930-28-2. [S706] Unknown author, The Casket. [S907] 1921 Canada Census, McFarlane # 0255. [S427] CBGHA, online www.cbgha.org, Excerpts from May 2003 CBGHA E-zine. [S309] April 10, 1891 Canada Federal Census, 101 Newbury Street, Boston, Suffolk, Massachusetts, USA. Biography*: The 1881 Census lists Archibald as a joiner. [S100] Obituaries from The Casket Newspaper, 1852 - present, Obituary of MacFarlane, Angus B., 79-1931-42-2. [S100] Obituaries from The Casket Newspaper, 1852 - present, Obituary of Dougald MacFarlane, 85-1937-3-2. Religion*: Duncan Michael MacFarlane was Roman Catholic. Biography*: Duncan was listed as being from Margaree Harbor at the time of his marriage. [S100] Obituaries from The Casket Newspaper, 1852 - present, Obituary of Duncan MacFarlane, 57-1909-3-5. [S254] April 10, 1891 Canada Federal Census, 101 Newbury Street, Boston, Suffolk, Massachusetts, USA. [S341] Registration form to Gathering 2001 Committee, August 3, 2001, Sheet 2. Year: 1901; Census Place: Sydney (Town/Ville), Cape Breton, Nova Scotia; Page: 5B; Family No: 38. [S286] Index to Marriages, St. Joseph's-Antigonish;. [S115] David Monahan, "Coady - David Monahan, February 1997," e-mail to Donald J. MacFarlane, February 1997. [S429] Obituaries from The Halifax Chronicle Herald Newspaper, Obituary of Helen Florence Sperry. [S709] Diocese of Antigonish, Nova Scotia, Canada , Marriage record of Duncan McFarlane and Christy Coady, page 138. Nova Scotia Archives; Halifax, Nova Scotia, Canada; Death Registrations: 1864-1877; 1908-1966; Volume Number: 3; Page Number: 75; Reference Number: 455. Indiana Archives and Records Administration; Indianapolis, IN, USA; Death Certificates; Year: 1973; Roll: 04. Indiana Archives and Records Administration; Indianapolis, IN, USA; Death Certificates; Year: 1975; Roll: 10. Indiana Archives and Records Administration; Indianapolis, IN, USA; Death Certificates; Year: 1973; Roll: 16. Religion*: Mary Ann MacFarlane was Roman Catholic. [S246] 1891 Canada Federal Census, 101 Newbury Street, Boston, Suffolk, Massachusetts, USA. [S506] Robert Joseph Gillis, Two Gillis Families, page 94. Ancestry.com. 1901 Census of Canada [database on-line]. Provo, UT, USA: Ancestry.com Operations Inc, 2006. [S5] Marriage, Church Record, November 1884 to September 1935 St. Joseph's Church, Margaree, Records, page 86, line 7. Married Name: As of 1876,her married name was MacDonnell. Gives age in 1876 as 25. [S701] Certificate, see memo marriage of 1862-1908, McDonnell-McFarlane 1876. [S501] 1881 Canada Federal Census, 101 Newbury Street, Boston, Suffolk, Massachusetts, USA. Year: 1901; Census Place: Port Hood, Inverness, Nova Scotia; Page: 14; Family No: 134. Year: 1911; Census Place: 30, Inverness, Nova Scotia; Page: 27; Family No: 226. Year: 1891; Census Place: Port Hood, Inverness, Nova Scotia; Roll: T-6317; Family No: 107. Reference Number: RG 31; Folder Number: 45; Census Place: Port Hood North Polling District No 4, Inverness, Nova Scotia; Page Number: 2. [S616] Marriages Registered in Nova Scotia, Inverness County 1864-1877: #3. [S709] Diocese of Antigonish, Nova Scotia, Canada , Baptismal record of Catherine Elizabeth McDonell, page 84. [S709] Diocese of Antigonish, Nova Scotia, Canada , Baptismal record of Donald Duncan McDonald, page 103. [S709] Diocese of Antigonish, Nova Scotia, Canada , Baptismal record of Ann Bell McDonell, page 148. [S709] Diocese of Antigonish, Nova Scotia, Canada , Baptismal record of John Angus McDonell, page 107. [S709] Diocese of Antigonish, Nova Scotia, Canada , Baptismal record of Mary Catherine McDonald, page 100. [S500] Allan J. Gillis, "Descendants of Angus "The Miller" MacFarlane # 74," e-mail to Donald James MacFarlane, October 11, 2005, page 4. [S709] Diocese of Antigonish, Nova Scotia, Canada , Baptismal record of Maggie Bell McDonell, page 106. [S709] Diocese of Antigonish, Nova Scotia, Canada , Baptismal record of Duncan Angus McDonell, page 109. Original data: Canada. "Soldiers of the First World War (1914-1918)." Record Group 150, Accession 1992-93/166, Box 4930 - 35. Library and Archives Canada, Ottawa. [S709] Diocese of Antigonish, Nova Scotia, Canada , Baptismal record of Mary Cecelia McDonell, page 109. Religion*: Isabel MacFarlane was Roman Catholic. [S610] April 11, 1881 Canada Federal Census, 101 Newbury Street, Boston, Suffolk, Massachusetts, USA. [S1] J. L. MacDougall History of Inveness County, page 418. [S500] Allan J. Gillis, "Descendants of Angus "The Miller" MacFarlane # 74," e-mail to Donald James MacFarlane, October 11, 2005, page 2. [S709] Diocese of Antigonish, Nova Scotia, Canada , Marriage record of Hugh McLean & Mary MacFarlane, page 73. [S100] Obituaries from The Casket Newspaper, 1852 - present, Obituary of Mary MacLellan, after June 14, 1903. [S9] Births, Church Record, June 1977 to September 1944 St. Joseph's Church, Margaree, Records, page 4, line 31. [S9] Births, Church Record, June 1977 to September 1944 St. Joseph's Church, Margaree, Records, page 8, line 10. [S100] Obituaries from The Casket Newspaper, 1852 - present, Obituary of Malcolm MacFarlane, 55-1907-20-5. [S1053] 1891 Canada Census, MacLennan # 4170. [S701] Certificate, see memo marriage of 1862-1908, Collins-McFarlane 1883. [S427] CBGHA, online www.cbgha.org, 1838-41 Cape Breton Census. Margaree, west Side of River to Forks; South West Branch, both sides. [S161] Unknown compiler address, NS Vital R. - Deaths, MacFarlane, Isabella # 270. [S497] St. Michael's Parish Record, East Margaree, online www3.nf.sympatico.ca/trish.leblanc/stmichaels.html, Birth record of Isabelle McFarlane. [S818] J. R. Reid, Descendants of Angus MacLellan # 8701, page 41. Religion*: Sarah (Iain MacColum) MacLellan was Roman Catholic. [S27] April 17-18, 1891 Canadian Federal Census, 101 Newbury Street, Boston, Suffolk, Massachusetts, USA. [S325] 1881 Canada Federal Census, 101 Newbury Street, Boston, Suffolk, Massachusetts, USA. St. Joseph's Cemetery, SW Margaree. [S100] Obituaries from The Casket Newspaper, 1852 - present, Obituary of MacFarlane, Patrick, 1948-40-12. [S701] Certificate, see memo marriage of 1862-1908, McFarlane-McIsaac 1903 February 22. [S264] April 16, 1901 Canada Federal Census, 101 Newbury Street, Boston, Suffolk, Massachusetts, USA. [S100] Obituaries from The Casket Newspaper, 1852 - present, Obituary of John MacFarlane, 1950-vol. 98-41-10. [S100] Obituaries from The Casket Newspaper, 1852 - present, Obituary of James M. MacFarlane, 1955. Language: John MacFarlane spoke English. Language*: He spoke Scotch Gaelic. [S100] Obituaries from The Casket Newspaper, 1852 - present, Obituary of John MacFarlane, 50-1901-24-5. [S28] April 10, 1891 Canada Federal Census, 101 Newbury Street, Boston, Suffolk, Massachusetts, USA. [S331] 1881 Canada Federal Census, 101 Newbury Street, Boston, Suffolk, Massachusetts, USA. [S701] Certificate, see memo marriage of 1862-1908, McLellan-McFarlane 1907 November 24. [S701] Certificate, see memo marriage of 1862-1908, McDonald-McFarlane. [S701] Certificate, see memo marriage of 1862-1908, McFarlane-McIntyre 1903. [S664] 1881 Canada Federal Census, 101 Newbury Street, Boston, Suffolk, Massachusetts, USA. [S818] J. R. Reid, Descendants of Angus MacLellan # 8701, page 91. [S1055] 1871 Canada Census, MacLennan # 4170. [S1] J. L. MacDougall History of Inveness County, page 367. [S497] St. Michael's Parish Record, East Margaree, online www3.nf.sympatico.ca/trish.leblanc/stmichaels.html, Birth record of Angus John McLennan. [S685] Unknown author, "Descendants ofJohn MacLennan and Anne MacLeod." [S709] Diocese of Antigonish, Nova Scotia, Canada , Baptismal record of Isabella MacLennan, page 14. [S709] Diocese of Antigonish, Nova Scotia, Canada , Baptismal record of Christine MacLennan, page 33. [S709] Diocese of Antigonish, Nova Scotia, Canada , Baptismal record of Isabella MacLennan, page 82. [S709] Diocese of Antigonish, Nova Scotia, Canada , Baptismal record of Mary Ann MacLennan, page 112. [S497] St. Michael's Parish Record, East Margaree, online www3.nf.sympatico.ca/trish.leblanc/stmichaels.html, Birth record of Roderick Simon McLennan. [S427] CBGHA, online www.cbgha.org, Excerpts from 2007-01. 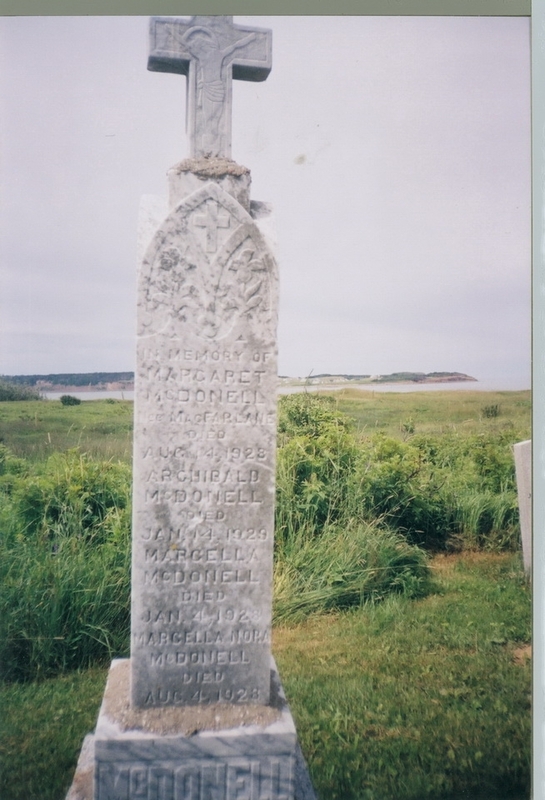 [S489] Donald James MacFarlane, St. Joseph's Church Cemetery, S. W. Margaree, Row , plot. [S892] 1921 Canada Census, Collins, ID# 2048. [S5] Marriage, Church Record, November 1884 to September 1935 St. Joseph's Church, Margaree, Records, page 90, line 8. [S701] Certificate, see memo marriage of 1862-1908, McLeod-Collins 1904 July 26. Year: 1901; Census Place: Margaree (Southwest/Sud Ouest), Inverness, Nova Scotia; Page: 1; Family No: 1. [S100] Obituaries from The Casket Newspaper, 1852 - present, The obituary of Mrs. John (Jessie MacFarlane) MacDonald, 48-1899-8-5. [S709] Diocese of Antigonish, Nova Scotia, Canada , Baptismal record of John Donald McDonald, page 85. [S709] Diocese of Antigonish, Nova Scotia, Canada , Marriage record of John McDonald and Jessie McFarlane, page 129. Married Name: As of circa 1865,her married name was MacLellan. [S1] J. L. MacDougall History of Inveness County, page 390. [S709] Diocese of Antigonish, Nova Scotia, Canada , Baptismal record of John MacLellan, page 34. Ancestry.com. 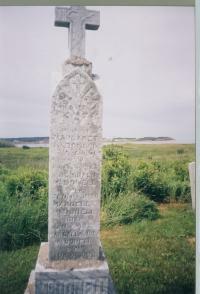 Nova Scotia, Canada, Antigonish Catholic Baptisms, Marriages, and Burials, 1823-1905[database on-line]. Lehi, UT, USA: Ancestry.com Operations, Inc., 2017. [S861] Ancestry.com, online www.ancestry.com, 0861 - 4385a - Donald MacLellan.docx. [S425] 1881 Canada Federal Census, 101 Newbury Street, Boston, Suffolk, Massachusetts, USA.